I've not written much in 2018. I didn't write much in 2017 either, I don't think. I guess the world has turned into the kind of place where there's no much fun to be found. With Donald Trump and Brexit it's hard to find anything to laugh about, really. But you know, one has to keep waddling forwards into the future. Face it with a grin. I'm never giving in. And all that jazz. So, it's been sunny. Too sunny. The garden looks like someone's been out with a magic hoover and sucked all the green away. The lawns are a torched shade of brown, although the hot weather has been great for this year's mulberry crop and the apple tree which collapsed last year has put on an astounding amount of new growth this year. It's hard to know how to keep cool in this weather. I'm not someone who's comfortable going out and about in skimpy outfits, and so it tends to be polo shirts and jeans for me, which doesn't really help with the whole "keeping cool" thing. Last weekend we had a few thunderstorms which gave a brief flush of verdant relief to the garden, but everything is slowly becoming parched again as this week has burned on. We've got a pretty large garden, and most of the established plants have their roots down deep enough to survive this kind of weather without too much trouble, but in the new edibles garden that I planted this year, we've had to keep watering to keep the new plants happy until they establish themselves. Whilst we've managed to keep (almost) everything going through the dry weather with use of a sprinkler, this has also meant that the weeds in that part of the garden have had both hot sunny weather and a lot of water, and so they've had a little bit of an explosive period of growth at just the time when it's too hot for me to be bothered and go and sit out there and do some weeding. In fact, I've spent most of my time indoors with the curtains and windows closed, keeping the room as dark as possible. I ventured out into the garden last night, quite late, and completely forgot about the underground wasps nest I'd seen earlier in the day. One misplaced foot and I glanced down to see a black blob attached to the back of my heel, followed seconds later by a burning pain which seemed to spread throughout my entire foot. You know, I don't ever recall having been stung by a wasp before. I must've been, certainly as a kid. But I can't remember it. I've been bitten by a few insects since having the house out here in the country, including the one last year where my hand seemed to inflate like a balloon for a few hours. That was a little concerning. I don't tend to get concerned with things like that though. It's the kind of thing I tend to post on Facebook, and the reaction can sometimes be slightly dramatic - like the time when I had a large bruise on my arm caused by a rose thorn puncturing quite deeply and one of my Facebook friends warned me it could be blood poisoning. My approach to anything like getting stung or cutting myself is the same as pretty much anything else medical - the body is pretty good at healing itself from most things, and so I don't run to the doctor every time I have a cold and much as I sometimes aim for sympathy, my general approach to pretty minor stuff is to put up with it until it heals. It's served me pretty well so far. We recently got a place in the countryside. So we're now splitting our time back and forth between the house out here and the flat back in Wapping. And so that means the guinea pigs come back and forth with us too. At first they weren't so keen on the idea; previously the cat basket had been associated with trips to the vet and the ensuing prodding and poking, so they didn't take too kindly to it. But now, after only a couple of months, they've settled into the routine of going back and forth between two cages. Given we moved into this house when it was still cold, their cage was in the sun room. I wouldn't call it so much as a conservatory; it's just a simple building attached to the back of the house with lots of windows, and heating and lighting - so ideal for the guinea pigs in winter when we wouldn't really be using the room anyway. It's now been just over a year since I quietly stopped drinking alcohol. I'm not the first person to stop drinking, and I won't be the last, but making the decision not to drink alcohol has given me some insights into alcohol, and how people view it - and how people view those who don't drink it. 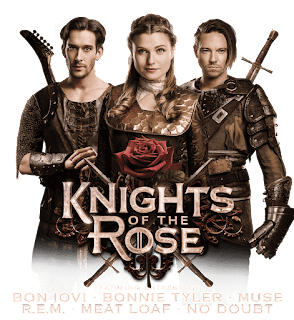 Last night, I went to the theatre with some friends to see Knights Of The Rose. We bought the tickets when we saw the song list and couldn't resist it. But then as the day of the show grew closer I started to read reviews, and let's just say they weren't great. In fact they were mostly awful. Well, let's be a little more specific; the reviews were universally terrible. I started to become concerned. The main concern of the reviewers seemed to be that the show was unknowing. They suggested that whereas shows such as We Will Rock You and Rock Of Ages were ridiculous, they revelled in their own pomposity and broke the fourth wall to let you know that they were in on the joke. No such fourth wall breaking here, and there was a clear thread in all the reviews that the show didn't know how silly it all was.